Creative Artists Agency, Holt Renfrew TIFF Party, MAC Cosmetics, Philip Sparks fashion shows, Frocktails and ReThink Breast Cancer. Exhibitions for Sheridan College (Illustration and Interior Design Schools), Ryerson University, LuminaTO, and MADE Furniture, just to name a few. Many celebrities have been to the Burroughes like Geena Davis, Susan Sarandon, David Cronenberg, Coco Rocha, Brad Pitt, Angelina Jolie, Drake and many more. Originally built as a Department store in 1907 with an addition in 1910, the Burroughes is continually defining Queen Street West as the tallest building on this trendy stretch. The Burroughes was not always known as such. Only until recently, once Queen Street Partnerspurchased and repositioned the property, did the name emerge. After much thoughtful research and consideration did what we celebrate today become a recognized brand. The building has been expertly renovated to carefully preserve its priceless character features. With restored elevators, wood details and exposed brick the property is like no other in the city. Described as a hidden gem by the real estate investment community, while taste makers simply comment that only those who should know, know about the property. The entire 6th floor with access to the Burroughes Terrace on the roof top. Offers the best views of the city skyline. 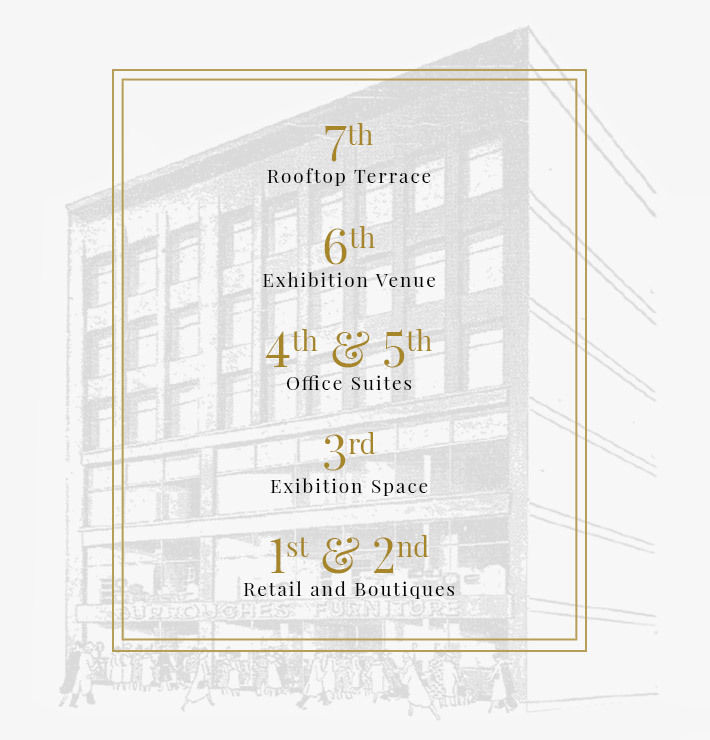 Find out more about The Burroughes Building Info, Retail and Office Space.